If there is one word that could define the youth today, it would be “confused”. Now, this confusion is bad or good is a matter of debate actually. But almost everything causes confusion in their lives. Education, career, relationships (or the lack of them), money etc. Some people choose to surrender to the confusion and take the easiest way out by listening to others who want to make decisions for them. But there are others, a different breed, who do not want to give in to the confusion but strive to look beyond it and carve a way through it. 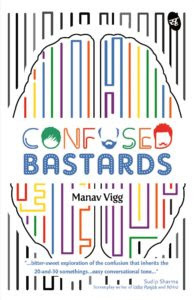 Confused Bastards is a story of three such extremely confused, almost delusional, young men who take a leap, sometimes to succeed and flounder at others.